This picture depicts one of the most dramatic and most famous scenes from the Gospel. We see the moment when Jesus just departed for prayer with his disciples. He is calm and does not expect anything to happen very soon, after a few moments. Pupils do not suspect anything and sleep. They do not know that one of them turned out to be a traitor, that he was already in custody, so that she would take their Savior. The clothes of the guard and Judas himself are already visible on the horizon. The guards inevitably overtake Jesus, but so what. The miracle does not happen. In fear and confusion, the Savior turns his prayer to God. He does not understand why they want to punish him, because he has done nothing to anybody for the entire time he has been in the city. And here comes a sign from heaven from the Father Almighty. What does he want to say to his son? Will he save him? Not yet time: only angels stretch the cross to Jesus. This means that he does not avoid severe suffering on earth. Why do the Savior’s disciples sleep? This is a rather symbolic image: the dream has long been understood by researchers as a kind of spiritual death, because at this moment the soul leaves the body. She wanders. The picture is replete with other images – rabbits. They embody a certain timidity, fear, and carnal pleasures. So, the disciples of their Master left, renounced him. 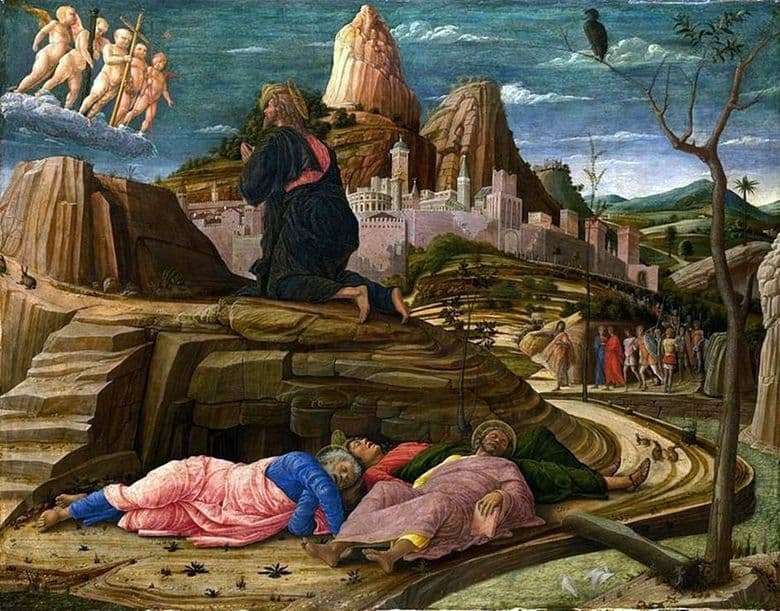 It is important to note that if there are a lot of rabbits near the legs of the apostles themselves, then they run away from Jesus. This is because Jesus has a divine origin. Carnal pleasures are alien to him, he is pure in his soul and thoughts. He is unshakable, but the apostles succumbed to fleeting weaknesses. The picture contains quite bright and bold strokes. The artist approached work with confidence. This gives the canvas additional energy: quite powerful and inexplicable, and such a large number of symbols and allegories envelops the viewer with an inexplicable feeling of anxiety.